Good afternoon. It is always gratifying when acknowledgment is made to the excellent amenities of the Wimbledon Football Club and such acknowledgment is made this afternoon when we are honoured with the privilege of staging the very interesting match between the Trinidad Touring Team and the F.A. Amateur XI. Many attractive representative matches have been played at Plough Lane since its inception but we doubt if any previous game has promised such a colourful spectacle as should be witnessed this afternoon. We extend a hearty welcome to both teams especially to our visitors from the West Indies. They have created a fine impression since arriving in this country and to date have won 5, lost 5 and drawn 2 of the 12 games played. This does not include the floodlit game with the Corinthian League to be played at Selhurst Park on Wednesday Oct. 7th. The F.A. nevertheless, has paid the visitors a high compliment by virtually fielding an International side, changes have been made from the team which lost to the South Africans, but loses nothing in effectiveness. The personal record of the F.A. team is well known but for the benefit of spectators we include brief pen-pictures of to-days probable Trinidad eleven. JOEY GONSALVES. Goal-keeper. Possesses a safe pair of hands and a thorough knowledge of the game. A popular selection as captain and has represented Trinidad on numerous occasions. Was honoured with the captaincy of the Caribbean team in Jamaica and Surinam during 1951 and 1952. GERRY PARSONS. Right-back. A sure kicker and one of the soundest backs in Trinidad. Has gained numerous representative honours since 1947 and was in the Caribbean side in 1952. BERNARD HOBSON GARCIA. Left-back. An energetic and fearless tackler. Has represented Trinidad on several occasions. Was out of the game with an injured collar bone last season but has now fully recovered. CONRAD ANGUS BRATHWAITE. Right-half-back. Can play in either wing half positions but prefers right-half. Is very speedy despite his 13 stone. ALLAN JOSEPH. Centre half-back. Is probably the best centre-half in the West Indies. A fast constructive player with good positional sense. Has played 21 consecutive representative matches and was also in the Caribbean side in 1951 and 1952. DOYLE GRIFFITH. Left half-back. A forceful tackler and a grand 90 minute player. Now 21 years of age but has represented Trinidad since 1950. Was chosen for the Caribbean team in 1952. R. HAMEL SMITH. Outside right. A good winger but probably best at inside-right where he earned a reputation as a clever ball player. Has represented Trinidad and was also a member of the 1952 Caribbean team. CARLTON 'SQUEAKIE' HINDS. Inside-right. Has a reputation with Trinidad soccer fans as a clever dribbler and ball distributer and in addition has a powerful shot in either foot. Diminutive in appearance his artistry enables him to hold his own in any company. FYLBERT SEYMOUR. Center-forward. A very fast forward and his 5 goals make him the top-scorer of the touring side. 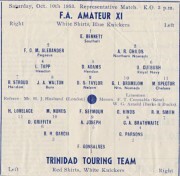 Played in the Caribbean team in 1952 but this is his first appearance on a representative match for Trinidad. MATHEW NUNES. Inside-left. A clever forward with good ball control and a shot in either foot. Played in the Caribbean side in 1952 and considered the star forward of the touring side. HORACE LOVELACE. Outside-left. A very fast left-winger who has greatly impressed English critics since playing in this country. Has been selected on numerous occasions for Trinidad. With the best of luck to both teams and pleasurable watching to all spectators.